Boasting a full-bodied flavor that comes from a propriety combination of chili and garlic, Premio Chorizo Sausage is a must-have for home chefs at every skill level. Our Chorizo sausage can breathe new life into classic dishes like pasta, skillet rice and even dumplings. 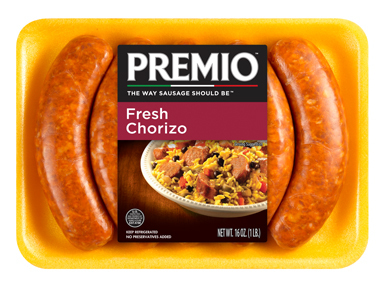 Turn something old into something new, flavorful and satisfying with Premio Chorizo Sausage. Pick up some of our Chorizo sausage and start reinventing your favorite dishes today. Ingredients: Pork, Less than 2% of the following: Water, Salt, Sugar, Paprika, Potassium Chloride, Vinegar Powder (maltodextrin, vinegar solids & modified corn starch), Onion and Garlic Powder, Extractives of Paprika, Natural Flavors. Do you like hot food? So many people crave the distinctive bite that comes with sausage, but when you need to kick it up a notch, you should turn to chorizo. This spicy and smoky sausage originated in Spain and Portugal, but most people now associate it with Mexico. Mexican restaurants in the United States rely on chorizo to deliver extra flavor across a slew of dishes, using chili peppers and garlic for the tongue-scorching heat. You can also grill it for a top-notch sandwich or add it to a stir fry. It blends perfectly with vegetables and starches, giving you a hearty protein to base your meal on. We make all of our chorizo from fresh ingredients. We don’t add any preservatives or fillers, meaning you get the best possible quality of meat. We also skip the MSG, part of Premio Foods’ commitment to your family’s health. Parties are a time for celebration, and nothing helps you celebrate like delicious food. When you buy our chorizo, you have so many options for your next get-together. Hosting a tailgate? Make a dip using chorizo, cheese and salsa, and have your friends provide the chips. Heading to a brunch? Guests will wolf down an egg-and-potato casserole topped with crumbled chorizo in no time. Having lunch with a healthy bunch? Try a light salad with sliced chorizo. No matter your friends and families’ tastes, chorizo fits onto the menu. Sausage works within a healthy diet. It makes an ideal source of protein because it’s also low in calories. The fiery chili flavoring can help rev your metabolism, and garlic is an aromatic that has been proven to help fight disease. Our motto is Premio: The Way Sausage Should Be! We proudly stand behind that. Our goal is to provide hearty foods to growing families. You need to feel good about what you feed the ones you love. We help you do that by providing delicious sausage as well as offering assistance and support to our community. Premio Foods has initiated many programs to help the environment, such as reducing water waste and greenhouse gases. We have pushed to make our packaging as green as possible. We set sustainability goals for our company that we’re proud to achieve. You deserve food from a company you will be proud to support. Premio Foods’ commitment to our neighbors through food bank and charity fund-raising programs is another thing we love to do. We believe in the importance of community, and we put in the time. Are those company values you can get behind? Then we invite you to order from Premio Foods online today, or seek out our products at a store near you.